Most people associate Joseph Haydn with his time in the town of Eisenstadt, serving as musical director at the court of the Esterházy family out to the east of Vienna. But he actually had a surprisingly long association with Austria’s capital. 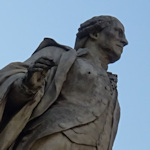 He arrived here in 1740 aged just eight to serve as a chorister at St. Stephen’s Cathedral and stayed for almost 20 years before leaving for Bohemia and then Eisenstadt. He didn’t return to live in Vienna permanently until the 1790s, eventually settling in a quiet suburb until his death in 1809. In the years between those Viennese periods, Haydn still visited the city, of course…with his princely employer, to visit friends (like Mozart), and to give or attend performances of his works. In a city of composers, Haydn probably takes a solid third place behind Mozart in first and Beethoven in second (no doubt keeping ahead with the added energy from all that coffee he drank). Let’s put Schubert in fourth place. Below is a map of relevant locations for Haydn’s Viennese homes, Haydn monuments, and similar. Below the map are photos and notes for the places marked. Many of the places associated with Haydn are long gone, often victims of 19th-century city construction projects: I haven’t marked these missing buildings unless there is a plaque there to see. Haydnhaus (Haydngasse 19): The house where he lived for the last 12 years of his life is now an excellent Haydn museum. This is the unmissable bit of any Haydn tourist trail. And as a special bonus, it includes a virtual parrot. Haydn monument (Mariahilfer Straße 55): A large statue built in 1887 to honour the composer. His rather imposing figure stares out over one of Vienna’s busiest shopping streets and sits at the centre of a small advent market in winter. Maria Theresa monument (Maria-Theresien-Platz): Although this 19th-century monument is dedicated to Empress Maria Theresa, it includes numerous large reliefs featuring key personalities from her reign. This includes composers like Mozart and Gluck…and Haydn. Ankeruhr (Hoher Markt 10-11): This mechanical clock was a gift to the city from an insurance company. A set of 12 historical figures rotate around its front twice a day. Most of these figures are Imperial personalities, but one exception is the composer that appears between 12 and 1, his arrival greeted by an excerpt from the oratorio, The Creation. No prizes for guessing who that composer is. Stephansdom (Stephansplatz): Just about everyone important in Vienna has a connection with the main cathedral. In Haydn’s case, he sang in its choir until his voice broke, and also married Maria Anna Keller there in 1760. Mozart apartment (Domgasse 5): The only Mozart residence still preserved in its original structure. Now a museum, it’s here that Haydn and Mozart played together in a string quartet, for example. You can stand in the very room their casual performances took place in. Gulp. Neue Burg (Heldenplatz): This houses the historical musical instrument collection, which includes a fortepiano allegedly played by both Haydn and Beethoven, as well as a wax head of the master, made during his life. Well, the Haydnhaus mentioned above is one of only two places that still exist (as far as I can tell). The other is the house on Kohlmarkt (number 11), known as the Großes Michaelerhaus. Haydn lived here after being thrown out of the choir, offered shelter by the court poet, Pietro Bonaventura Metastasio. Both have plaques dedicated to them at the end of the house. I found no other residences with the original building still intact. House number 2 on the Neuer Markt square does, however, bear a plaque indicating that Haydn lived on that site between 1795 and 1797. This Neuer Markt house is where he wrote the Kaiserlied, a hymn to the emperor of the time (Francis I/II). The melody was famously later used for the German national anthem. Regrettably, as noted, not so many places remain from the heady days of the 18th century, nor do I have enough historical records to track down all the aristocratic homes he may have visited or performed in. Church of the Barmherzigen Brüder (Taborstraße 16): The church (first built in 1622) belongs to a monastic complex that includes a modern hospital. According to the order’s own information, Haydn was employed as a church musician (“first violin”) there in the 1750s, before leaving in 1758. Outside the church is a plaque suggesting he was active in/with the choir between 1755 and 1758. Piaristenkirche (Piaristengasse 43-45): This early 18th-century baroque church hosted, for example, the premiere of Haydn’s Missa in tempore belli (Mass in Time of War) on December 26, 1796. Esterházy Town Palace (Wallnerstraße 4): The “townhouse” of the Esterházys, built in the 17th century. Haydn would have accompanied his employer there. Karmeliterkirche (Karmelitergasse 10): Haydn worked here as an organist during his early years. This 17th-century church originally belonged to a Carmelite order (hence the name, still used colloquially today), but is now the parish church of St. Joseph. The Haydnpark: Haydn’s last resting place is in Eisenstadt, about an hour’s drive from Vienna. But he was first buried in the Hundsturmer cemetery, not far from the Haydnhaus – the body was moved to Eisenstadt in 1820. The cemetery is long gone, replaced by a nondescript park named in honour of its one-time “resident”. Gumpendorf parish church (Brückengasse 5): There’s a plaque outside this little 18th-century church noting that it was here that Haydn’s body was blessed before its burial. Haydngasse and Joseph-Haydn-Straße: Both streets bearing his name (not sure that needed explaining). How do I see a classical concert?